One especially for my American audience…. 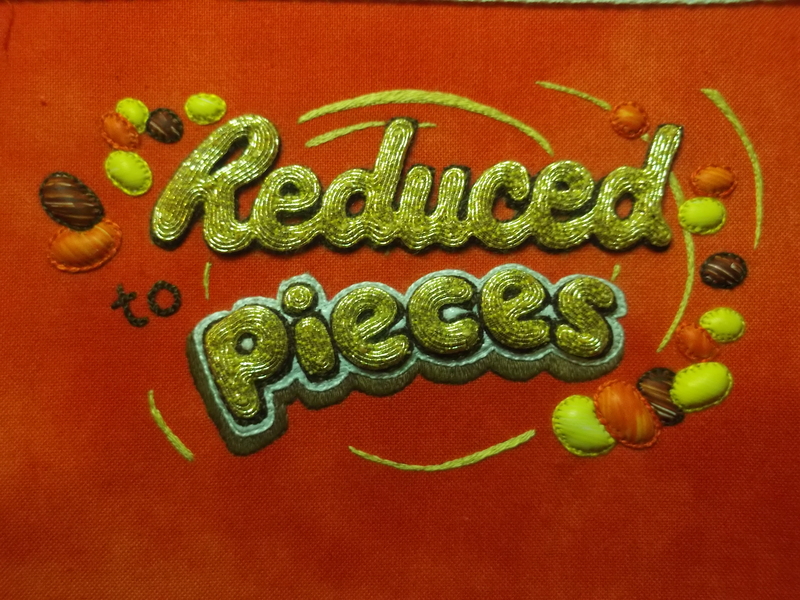 Reese’s Pieces’ embroidered wrapper complete. This marks the 12th completed piece in the series and, for now, the completion of this phase of work in my visual explorations of discussing an eating disorder. 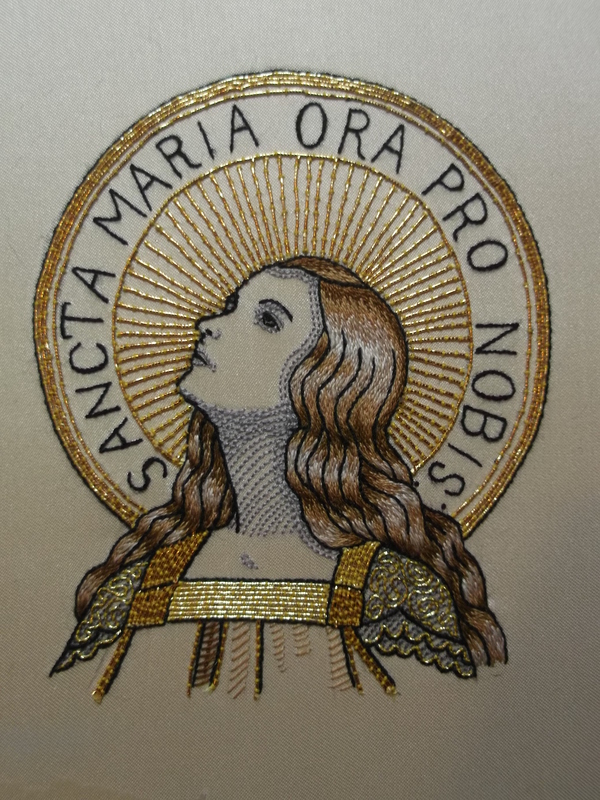 Potentially another 2 designs are drawn up for their embroidered execution, but I am as yet unsure whether to proceed to those or to concentrate on a slightly shifted focus. It was surprisingly difficult to source the original of this particular wrapper here in the UK. Supermarkets seem to stock ‘Reese’s peanut butter cups’, but not this version. I finally found success in my university shop of all places, which can also boast the peanut butter flavoured M&Ms allegedly banned throughout the UK for their artificial additives. The above shows this piece with the background padding prepared for the gold couching. 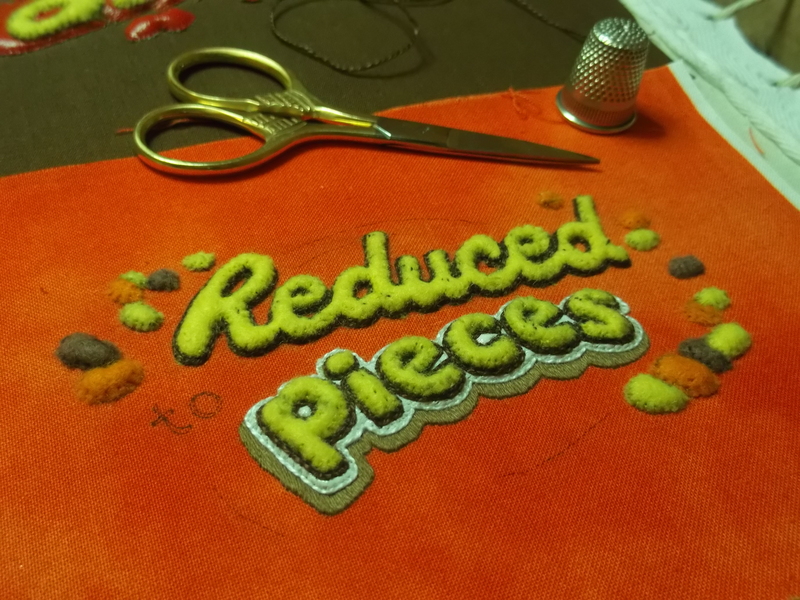 I blunt a lot of scissors cutting the intricate strings of lettering out of felt, not to mention the damage cutting all the metallic threads do. Hence I usually have several pairs of small embroidery scissors ‘on the go’ at once, reserving the sharpest for snipping threads and the not-so-perfect ones for hacking away at acrylic felt. 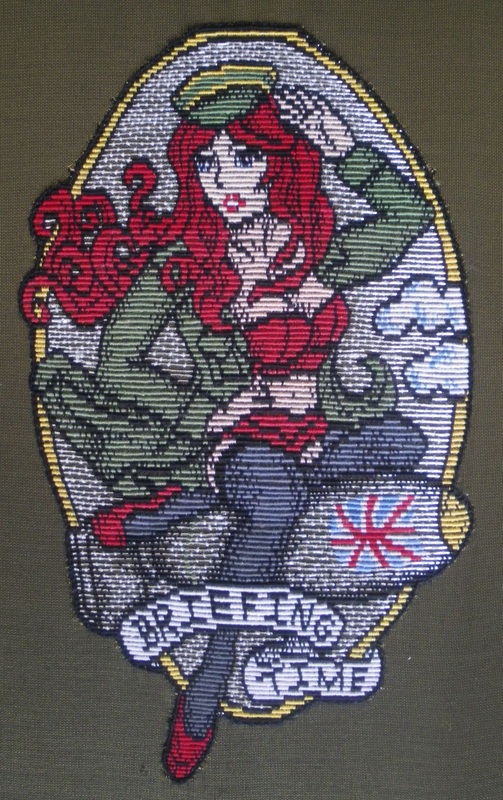 I’ve also recently started a page for ‘Hanging By A Thread Embroidery’ on Facebook – please be sure to ‘like’ me on there and stay up to date with where these go! I have set scissors for my gold work, just so happens they are gold too. I dont use them for anything else & now never cut metal threads with anything else. Ps your work is still fantastic! When I was working for hand embroidery company Hand And Lock, the intern ‘borrowed’ my best scissors to cut paper with… that was not a happy moment explaining she should have known better! This is interesting work, using your needle to talk about eating disorders, I can’t wait to see where it goes. Thankyou! It finally seems like the right time and the right method to talk about something important to me…. If nothing else it’ll put all of those years of ‘experience’ to some positive outcome.